Using every opportunity to bring the mind and lifestyle back to the Divine is an ancient spiritual practice in authentic system. In India, each day of the week is a Divine day, an occasion for worship. With each day dedicated to an aspect of the Divine, Thursday is Guru Day. It began with Bṛihaspati, a great sage born from the first great light, to drive away darkness. Bright and pure, he carries a special bow whose string is “.rta” or cosmic order. With revered knowledge and character, he is the Guru of the many celestial divinities (gods). Bṛihaspati has a golden body and wears golden or yellow clothing. He was worshipped by the Greeks as Zeus, by the Egyptians as Ammon and by the Romans as Jupiter. Just as Sunday is named for the sun, and Monday for the moon, Brihaspati’s name is the root of the word for Thursday, Bṛihaspati-vara. It is also known as “Guruvara,” with “vara” meaning day and “Guru” meaning spiritual teacher. Bṛihaspati or Guru is also the name of a planet, cited in the Vedas as the auspicious and benevolent Jupiter. In Vedic astrology, a sister science of yoga, Jupiter is known as a great giver or granter of fortune. You are invited to join us on Thursday mornings for chanting of Sri Guru Gita at Downingtown Yoga & Meditation Center. This is also available by phone for Shishya members. This entry was posted in Ashram News on August 29, 2017 by Svaroopa Vidya Ashram. When I first heard Swami Nirmalananda state that, I thought, “Where’s the fun in that? Isn’t having a good time about having fun?” My idea of having a good time was anything that was pleasurable. It was definitely not about pain and suffering. If yoga and meditation gave me pleasure, great. If they pushed me into uncomfortable stuff, not so great! Svaroopa® yoga and Svaroopa® Vidya meditation have given me so much pleasure and satisfaction. But they’ve also pushed me into all sorts of “stuff.” This has included physical, mental and emotional reactions and relapses. Yet a decade later, I’m still at it. Why? These practices give me a deeper experience of my own essence, my own Self. When I feel reactive and relapsed, I am thinking too small. I’m not seeing the big picture. I am forgetting who I really am. The big picture is that I AM Shiva, Self. I am Consciousness Its-Self. I am Chiti, conscious energy, made of the same stuff as everyone and everything in the universe. I just don’t always remember that. I forget who I am, again and again. It’s kind of like spiritual amnesia. When I forget, I think I’m “just” Carolyn, who lives in Boise, is married, has a daughter and teaches yoga. Based on these identities, I easily slip into reactive mode, causing myself (and often others) distress. In my “cautious driver” identity, I yip at my husband for driving too fast or too close to other cars. In my “protective mother” mode, I try to over-control my disabled daughter’s choices. When I remember who I am under all these layers, I have a new perspective on my human experience. When I am not caught up in the malas, I feel more my Self. Swami Nirmalananda and Rukmini write about these layers of limitations in our August contemplation article, Nirmala: Without Malas. Aanava mala is the layer of Self-forgetfulness. Who am I? It’s the existential question we were born to answer. Unfortunately, we answer by constructing identities that create a smaller sense of self. This is maayiiya mala. It doesn’t really answer the larger question, so then we create activity to fully inhabit these constructed identities. This is called karma mala. Not all of these layers are negative. Some are enjoyable. But none of them scratch the surface of who I really am. Chiti, Consciousness, made the choice to take on limitations, for the experience of being human. Chiti IS having a good time being you, when you’re not having a good time and when you are. This is a grand cosmic game of hide and seek. Chiti has set you up to uncover the layers and find Her. In doing so, you find your own Self. The game is a quest. To uncover who you really are, you must have a game changer, a Shaktipat Guru. Swami Nirmalananda is empowered to give you the initiation that pierces the first mala, the not-knowing. While the piercing isn’t a complete dissolving, it’s enough for you to glimpse your greatness. Once you’ve received Shaktipat, yoga keeps you in the game. The process of radical discovery continues the rest of your life. The more you seek, the more you find. It’s a quest worth embarking upon. This entry was posted in Ashram News on August 22, 2017 by Svaroopa Vidya Ashram. even beyond the possibilities my mind could conceive. I knew there must be something more. given by his Guru — Shaktipat! by one who could give such a gift, Nityananda. like a shooting star illumining my path. All I had to do was find it. But I didn’t know where to look. So Muktananda came looking for me. that only such a great Guru could give — Shaktipat! For the discovery of what I had sought for so long. This entry was posted in Ashram News on August 15, 2017 by Svaroopa Vidya Ashram. Not everything that is fun is also beneficial, surely you’ve learned that by now. Just because something is unusual or interesting doesn’t mean you should get involved. This is also true of eclipses. The footprint of an eclipse is that of darkness overtaking light. Don’t expose yourself to it! This means stay indoors. This is a time to do Consciousness practices, especially mantra, chanting and meditation. Don’t eat. Don’t sleep. Some say you shouldn’t even drink water during an eclipse. Just as if a police helicopter were circling your neighborhood, it’s time to protect yourself. The ancient sages warned that the sun emits abnormal radiations during an eclipse. Even if you look at it merely metaphorically, if you are in the path of the eclipse, you are plunged into darkness during the usual time of light. Darkness propagates fear and unconsciousness, the loss of Self and being entwined in Maayaa. While an eclipse doesn’t last long, the imprint that it makes in your mind lingers, leading to harmful or painful results later. In addition to the event in the sky, www.dictionary.com defines “eclipse” as “a reduction or loss of splendor, status, reputation.” Examples include, “Scandal caused the eclipse of his career,” and “a soprano whose singing eclipsed that of her rivals.” You don’t want to be eclipsed. We are closing Downingtown Yoga & Meditation Center during the eclipse and sending our staff home early enough that they can avoid even the earliest edge of the sun’s darkening. 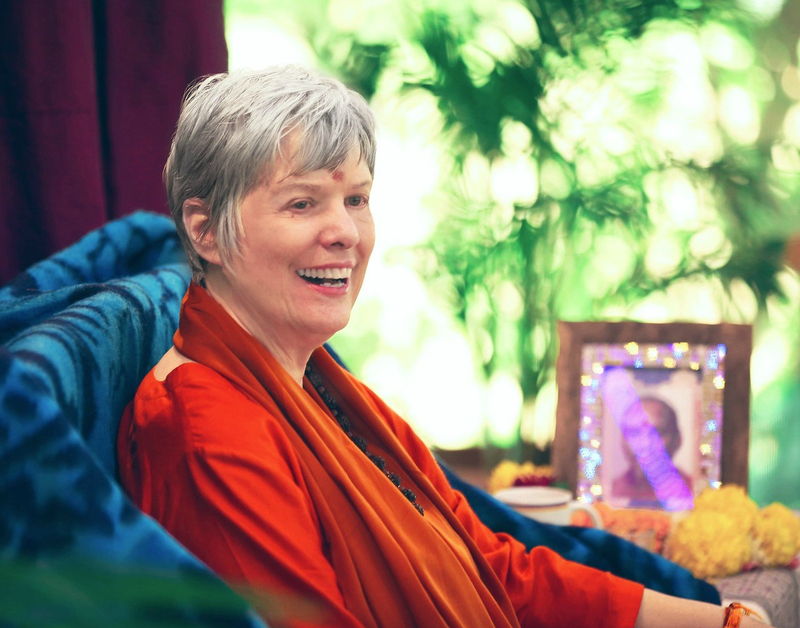 At the Ashram, we will be doing Consciousness practices throughout the whole time period. Chanting, mantra, meditation – a lovely immersion at a critical time. We will be doing the mantra of our lineage, as well as the Gayatri mantra and the MahaMrtyunjaya Mantra (easily available online). I invite you to join in. After the eclipse, you should bathe and change your clothes. Emerge back into the world slowly, as everyone else has been affected by the dark. When it is over, bathe and change clothes. These are wonderful yogic ways to take care of yourself! This entry was posted in Ashram News on August 10, 2017 by Svaroopa Vidya Ashram. Margot was delayed in getting to ME and got lost near her destination. She called Dasi’s cell, and is thankful that she answered even though the workshop had started. Dasi gave Margot directions and assured her that arriving late was fine. Just in time for the ribcage release, Margot couldn’t do the Seated Side Stretch being taught because of a shoulder issue. So Rukmini eased her into a Rotated Stomach Pose instead. And the rest of the day unfolded with more sweet openings. With Mandali Travels, Svaroopa® Vidya Ashram generates powerful bliss ripples. They are spreading transformation and strengthening Svaroopa® yoga communities far and wide. See our calendar for all our programs. This entry was posted in Ashram News on August 8, 2017 by Svaroopa Vidya Ashram. I have taught several styles of yoga. I have been introduced to many more. Nothing compares to Svaroopa® yoga. I teach Svaroopa® yoga because I know my students are getting the best care possible. They feel better physically, mentally and emotionally. Even after their first class, students often report huge improvements. For example, they confide that after that first experience of Svaroopa® yoga, they slept well for the first time in years. Some come to their first class as a last resort. They had been convinced they would have to live their whole lives in pain. But, after a few weeks of practice, their pain is gone. They feel better about themselves. They are happier. I teach Svaroopa® yoga especially because it empowers my students. I do not want them attending classes for a BandAid. They learn to take care of themselves, to take control of their healing. The Magic 4 and Ujjayi Pranayama give them a home practice. Most important is the transformative effect of Svaroopa® yoga at the deepest level. My students regain a sense of wholeness. They came in “beside themselves.” In class they return to Self within. What brings me the greatest satisfaction is what happens at the bookends of each class. As students arrive, I am grateful for the opportunity to adjust and ease them into a peaceful, deeply relaxing Shavasana. At the end of class, I enjoy seeing their transformed faces. Only 90 minutes earlier their faces were fraught with anxiety and exhaustion. As they sit up from Yoga Mudra, I see softer faces, with more color and sunny smiles. Their hearts are open, joyful and brimming with gratitude. Teaching Svaroopa® yoga always leaves me feeling more whole and healthy both physically and spiritually. From the appearance and testimonies of my students at the end of class, I know that they are experiencing the same. I would say it doesn’t get any better than this, but that’s not true. Every day, every one of the 20 years I have been teaching Svaroopa® yoga, it gets even better. This entry was posted in Ashram News on August 1, 2017 by Svaroopa Vidya Ashram.